IRVINE, Calif: The Mazda MX-5 is the most road-raced production car in the world. The reason is simple - great performance at an affordable price. Former Socceroo Brett Emerton has won the 2014 Mazda3 Celebrity Challenge ahead of Grease star Rob Mills and The Bachelor, Tim Robards, in an action packed final race at the 2014 Formula One® Rolex Australian Grand Prix. The first Mazda3 Celebrity Challenge race at the Formula One® Rolex Australian Grand Prix was dramatically cut short after Rachael Finch rolled her All-New Mazda3 half-way through the weekend's first race. Former Socceroo World Cup star, Brett Emerton, has scored pole position for the first race of the Mazda3 Celebrity Challenge at the 2014 Formula 1® Rolex Australian Grand Prix. Robbie McEwen lived up to the hype as the event's red hot favourite with a first place finish in the first round of racing. Charley Boorman, Nathan Brown and Brett Emerton rounded out the rest of the men's races. Mazda Australia and the Australian Grand Prix Corporation present the Mazda3 Celebrity Challenge at the 2014 Formula One Rolex Australian Grand Prix, this weekend at Albert Park, Melbourne. Mazda3 Celebrity Challenge drivers Brett Emerton, Robbie McEwen and Nathan Brown have emerged as the drivers to watch during the first set of practical exercises on day two of driver training at Sandown Raceway. The Mazda3 Celebrity Challenge driver training got underway at Sandown Raceway today with the celebrity drivers all itching to get behind the wheel of the All-New Mazda3, in preparation for the 2014 Formula 1+é-« Rolex Australian Grand Prix. What do a Winter Olympian, a Celebrity Chef, a Comedian, a Former Miss Universe Australia and a Getaway Presenter have in common? They have just been unveiled as the next batch of drivers to take to the grid at the Mazda3 Celebrity Challenge. Two-time ARIA award winner and multi-platinum artist, Megan Washington, is the latest celebrity to be unveiled as a driver in this year's Mazda3 Celebrity Challenge at the 2014 Formula 1Â® Rolex Australian Grand Prix. Australian cycling legend, Robbie McEwen, will trade his bike helmet for a racing helmet at this year's Formula 1® Australian Grand Prix when he lines up for the Mazda3 Celebrity Challenge. Mazda closed out the inaugural season of the GX class, during the final year of the Rolex Sports Car Series GRAND-AM championship, with another race win and another championship title. (INDIANAPOLIS, Indiana) When the Mazda6 SKYACTIV-D Clean Diesel racecar hits the track at the Indianapolis Motor Speedway this week, it will be the first time in six decades that a diesel has competed at the most famous track in the world. 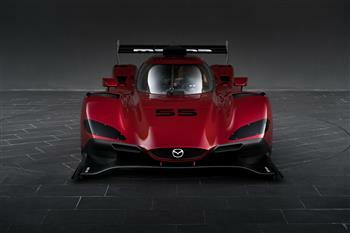 The new Mazda RT24-P race car was unveiled today at the Los Angeles Auto Show, ushering a new era in the prominent history of Mazda Motorsports' flagship endeavours in North America.